It only takes a few minutes for an irate client, or a jealous competitor to tarnish your reputation. We provide a highly effective, inexpensive service that will help you establish and maintain the stellar professional reputation you deserve - through the CompleteMarkets platform. A 'Certified Insurance Pro'seal that can be used on all marketing material. Early notification on Exclusive Consumer Leads. A comprehensive professional profile on CompleteMarkets.com – the destination site for insurance. Google optimized professional profile, localized, so you show up in the major search engines when clients research you. You get a spam-free (customize-able) email address. For example - yourname@CompleteMarkets.me. You can then use this for your DOI licensing, CE licensing and anywhere where you do not want to get spam (and receive legitimate messages only). 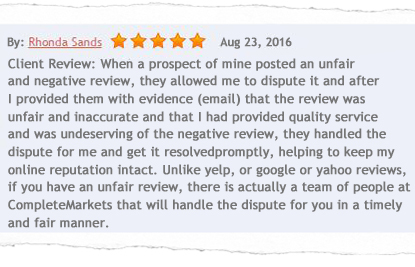 Ability to Dispute Negative Reviews – as a Prestige Pro member, you have 30 days to dispute any reviews before we make them public. This is a unique service available only to Prestige Pro members, and is designed to protect you from spammers, jealous competitors and misunderstandings with clients.